Students will be able to create group work guidelines. 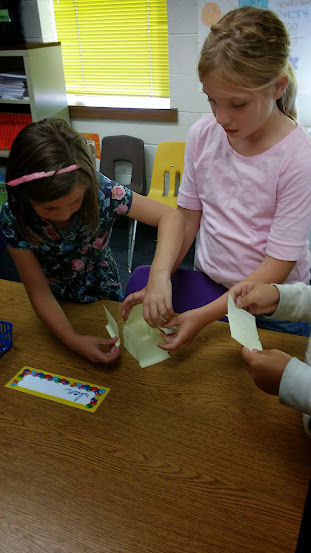 Teamwork is a strategy to solve problems and students must learn to work together in this lesson in order to build a post it note tower. I chose to do this activity as my first math lesson for a couple of reasons. First, I wanted to do something completely opposite of what my students believe math is. I was able to meet most of my students on the last day of school last year. Upon meeting them, one of the questions I had them respond in writing to, was, "What is math?" When I read their responses I had many students respond with statements like, "Math is a page of adding or subtracting. ", "Math is hard. ", "Math has lots of rules and I can't remember them all the time." Knowing that this is what my student think of math, I wanted to do something so opposite of those things, and almost startle the students. The post-it note tower activity isn't a text book math problem, or like anything they described in their written responses, but it is math. Students needed to be flexible in their thinking, create a plan, re-vise their plans as necessary, look for patterns and structure, and persevere. I wanted my students to leave their first math class excited, energized, and ready to be engaged all year long. The second reason I choose this activity is because I wanted the opportunity to talk with my students about a growth mindset. In her book, Mindsets, Carol Dweck discusses two mindsets, a fixed mindset and a growth mindset. A growth mindset is one in which people value mistakes and the learning opportunities presented when mistakes are made. While, I wouldn't necessarily call an unsuccessful tower a mistake, this activity allows for students to see many things they would do differently if given the opportunity to do this activity again. The activity allowed me to lead a class discussion about the importance of mistakes and that as fourth grade mathematicians, we want to welcome mistakes, so we can learn. I start this lesson by asking students what a Post-It Note is. I then tell them that their task today is to build a Post-it Note Tower as tall as they can with only 15 Post-it notes. I try to make this a dramatic as possible. My students asked if they could stick the tower down to the table or the floor if they use the sticky part of the post-it note. I referred back to the directions and together we decided that they could since the directions didn't say they could not. I use this website to set a visible timer for 15 minutes. This is a fun timer website because it allows me to choose interesting sounds for the buzzer. What is your plan? Do you have a plan? How did you come up with your plan? Is having a plan important? Is everyone participating? In this video you can see a group of students working to build their tower. These photos show students working on building their towers. Wow, the classroom was buzzing during this activity. Students were eager to start and get going. Several groups made no attempt to make any plan and everyone was taking post-it notes and trying various ways to stack them. One group sat back and discussed what they could do. They seemed extremely patient with each other and determined to be successful. While they had lots of energy, it was a different feel when talking with this group. They were talking about a plan, rolling paper and then stacking, or folding the paper. There was lots of laughter and overall general excitement with all the groups. Some of the questions I was asked included; Can we cut the post-its? Can we use tape?Can it be stuck to the floor? Is this really math? When the timer goes off, I ask students to look around the room at other towers that were created. This adds to the classroom climate that we are all a community and that through out the year we want to support each other. By observing others towers I am able to refer back to this situation in other math classes about not all math problems having one right way or one right answer. I congratulate the entire class and ask students to return to their seats. I then lead a discussion with students about some of the qualities of mathematicians. I begin this discussion by asking students to raise their hands if they would change their approach or strategy if they could re-do the assignment. Almost all hands were raised. I then talk with students about making mistakes and being flexible in their thinking. I express how important it is to make mistakes. I tell them that mistakes open the door for new learning. I ask students to raise their hands if their group started over at any point during the 15 minutes. Again almost every group raised their hand. I ask students to talk about what it was like working in their group. Students will often come up with group guidelines that should be followed the next time a group activity occurs.... taking turns, not talking all at once, listening to everyone, etc. I was very happy about the norms my class came up with. As the days and lessons progress, we add to this list. They know that this is their list, the guidelines they want to live by. The list changes through out the year or gets added to. This list makes group and partner work easy to manage. It allows me to refer to the list when addressing behaviors to groups of students or single students. You will see in this post it note tower photo (not from my class) just how tall a post it note tower could get! In my years doing this, I have yet to have a class of students roll their paper like in the included photo. I show my students this photo at the end and tell them that thinking outside the box is something they will get to experience in this class. Their eyes light up when they see this. They are usually amazed that they didn't think of rolling their paper. While this photo isn't an important part of the lesson or debrief, I think it adds to my belief that there isn't just one way to do math.